A good attitude is developed while waiting when you wait in the presence of God. The best things in life doesn’t come easily. In most cases you have to wait for it. Only God can answer that question. When you wait in the presence of God you will have full joy. In the presence of the Lord you will have peace that passes all understanding. You will be refreshed in the presence of the Lord. You will maintain your uprightness and integrity while waiting in the presence of the Lord. You will remain humble in the presence of the Lord. You will become a forgiving person in the presence of the Lord. Finally, you will develop an obedient spirit when you wait in the presence of God. All of the above attitude you will develop when you wait in the presence of the Lord. Acts 3:19; Psalm 16:11; 140:13; Proverbs 25:6; 2 Corinthians 2:10. I appreciated the listing of the benefits of waiting upon the Lord! 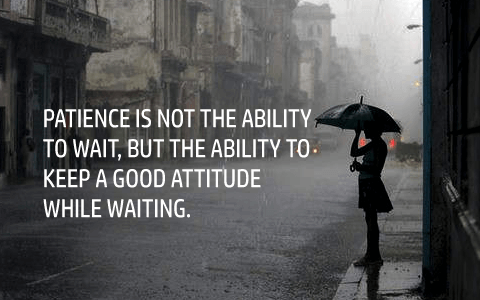 It is always good to have a good attitude while you are waiting for something.